in plate, along bottom: Magna Jovis coniux miré indignata quot esset / Fedare, etheros Parrhasis ausa theros. / Pellice protrata vulsiq infesta capillis, / Pulcra la deformis inssit ut urs foret. Hollstein, F.W.H. et al. German engravings, etchings and woodcuts ca. 1400-1700. 8 vols. Amsterdam: Menno Hertzberger, 1954-1868. 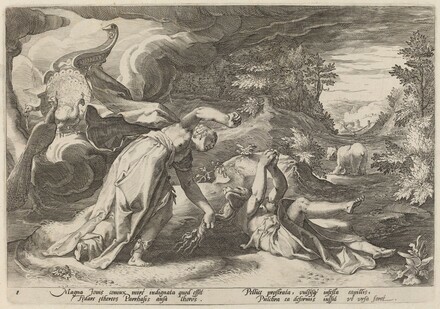 Dutch and Flemish etchings, engravings and woodcuts, ca. 1450-1700. Vols. I-XV, XVIII, XIX. Amsterdam: Menno Hertzberger: no. 535. The New Hollstein Dutch & Flemish Etchings, Engravings and Woodcuts, 1450-1700. Rotterdam: Sound & Vision Interactive, 1996-: no. 559, i/ii.